Preheat the broiler or oven to 500 F. and adjust the rack to the the highest position in the oven. Combine the oil and vinegar in a bowl large enough to hold the butternut squash. Whisk to combine the oil and vinegar thoroughly. 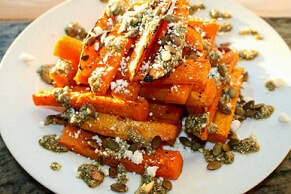 Toss the butternut squash with the mixture and arrange the squash in a single layer on a shallow, lined baking sheet. Liberally season the squash with salt and pepper. Roast the squash for 10 minutes per side, flipping half way through, until the edges turn golden brown. In the bowl of a food processor or jar of a blender, add the sage leaves, 1/3 cup of toasted pumpkin seeds, olive oil, and cheese. Process until the paste is fine in consistency. Season with salt and pepper to taste. Arrange the butternut squash on a decorative platter. (I built tall stacks with the butternut squash sticks). Drizzle the pesto all over the butternut squash, followed by the reserved toasted pumpkin seeds, and the reserved cheese. Serve warm.